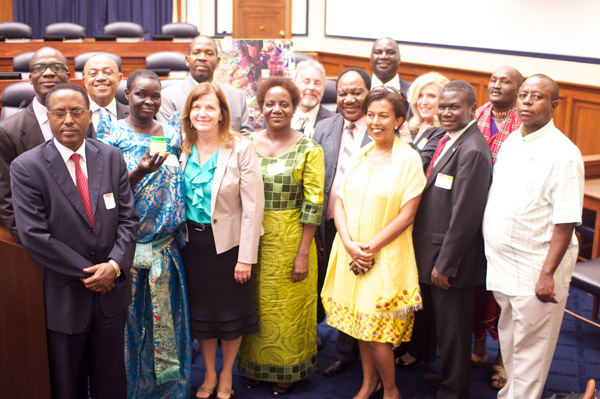 The formal launch of the African IP Trust took place in Washington, DC on July 26th, 2012 on Capitol Hill, to an audience of approximately 75 supporters. The event was co-chaired by Lord Paul Boateng and Congresswoman Diane Watson (ret.). Lord Boateng offered an opening speech outlining the strengths of the African economy. Ron Layton, Chief Executive Officer or Light Years IP presented the AIPT and IP initiatives underway and Dr. Margaret Brindle, introduced the African IP initiatives and their representatives from the Maasai tribe; Uganda; Ethiopia; and Zanzibar. Isaac ole Tialolo, co-chair of the Maasai Intellectual Property Initiative discussed the 2 year initiative underway for the Maasai of Kenya and Tanzania to regain control of their iconic brand. The Maasai are the first stakeholder group to receive formal support from The African IP Trust. Leonora Obelo Akello from Padar, northern Uganda spoke eloquently about distinctive Shea butter and the importance of this IP initiative as the economic engine for women of northern Uganda and S. Sudan. Juma Ali Juma, Deputy Principal Secretary of Agriculture, Ministry of Agriculture and Natural Resources, Zamzibar discussed the IP Value Capture opportunity and training by Light Years IP for Zanzibar Spices, which has received the support of the Zanzibar government. Attorney Getachew Alemu Mengiste summarized the Ethiopian fine coffee trademark and licensing initiative that he worked on with Ron Layton, while Getachew headed the Ethiopian IP Office in Addis Ababa, Ethiopia. His Honourable Norbert Mao, President of the Democratic Party of Uganda spoke at the reception about the importance of the African IP Trust and opportunities and goals to safeguard African IP. Attorney Esteriano Mahingila, head of BRELA, the IP office of Dar es Salaam spoke enthusiastically about the IP training his office has coordinated for Light Years IP in Tanzania, and offered the continued support of his office and network to the African IP Trust. Ms. Eskedar Nega, representing the United Nations Economic Commission for Africa (UNECA) offered her support to the AIPT. In addition, African IP Trust board member, Mr. Claude Fontheim, CEO of Global works and Fontheim, LLC spoke about the importance of the African IP Trust. During the event, a film about Ugandan shea butter, and a POV deck about the Maasai were shown. Ms. Carrie La Crosse, Senior Foreign Affairs Officer of IP enforcement division at the State Department hosted Light Years IP for an event on July 26th. Therein, Light Years presented to supporters from the State Department and USPTO and outlined the IP Value Capture training underway in Uganda and Tanzania/ Zanzibar, as well as the Maasai initiative. African stakeholders presented what IP Value Capture means in their countries and demonstrated their insights to the collective value of IP enforcement in Africa. Participants are coming forward with names of new possible allies to expand the African IP Trust sphere of influence. We welcome your suggestions for possible allies and resources to assist the AIPT in its mission of protecting African Intellectual Property. Light Years had a favorable follow up meeting with the S. Sudanese embassy to expand the IP shea butter initiative into S. Sudan. As always, we appreciate the ongoing support of our friends and colleagues at the USPTO and the State Department.